Northern Ireland boss Michael O'Neill thinks his side are suffering due to a lack of club football for their key players. 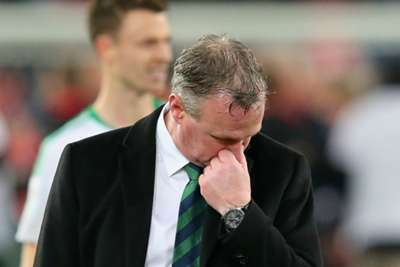 A 2-0 defeat to Bosnia-Herzegovina on Monday leaves Northern Ireland on the brink of relegation from League B Group 3 of the Nations League. O'Neill's side missed good chances in Sarajevo but were ultimately condemned to a third loss in a row in the competition thanks to a double from Edin Dzeko. The 49-year-old believes part of the problem comes from a lack of match sharpness for stars including Leicester City's Jonny Evans and Southampton's Steven Davis. "One of the things that's hurting us at the minute is a lot of our players aren't playing club football," he said. "Steven Davis and Jonny Evans are big players for us, and they haven't been playing much club football in the past month. We need to address that as well, but we're creating chances. "We just have to persevere and allow the team time to develop." Northern Ireland twice hit the woodwork but failed to score away from home for the sixth match in a row, something O'Neill is eager to address. However, he believes their Nations League campaign has been positive given the number of younger players who have been introduced to the side. "It's a steep learning curve for us," he added. "There were aspects of the game that were positive, but there were also other aspects that were negative. We played well for the first 25 minutes, but the goal really knocked us. "The reality of the situation is that we have no points in this competition. But I think if we look at the games, we've introduced a lot of new players into the team. We had three Under-21 players finish the game. "We're going to have experiences like that. They're not just going to come in and be able to play international football."